Nov 10, 2017 update: Allegations of sexual assault have recently been leveled against Franco Moretti by a former graduate student. The allegations initially published on Facebook and reported by the Stanford Daily Student indicate that the Title IX officer who took the graduate student's verbal report recommended against filing an official report. Moretti refuted the allegations in an email to Stanford Politics. Stanford University responded to the allegations via a spokesperson who noted the University's concern and intent to review the report. 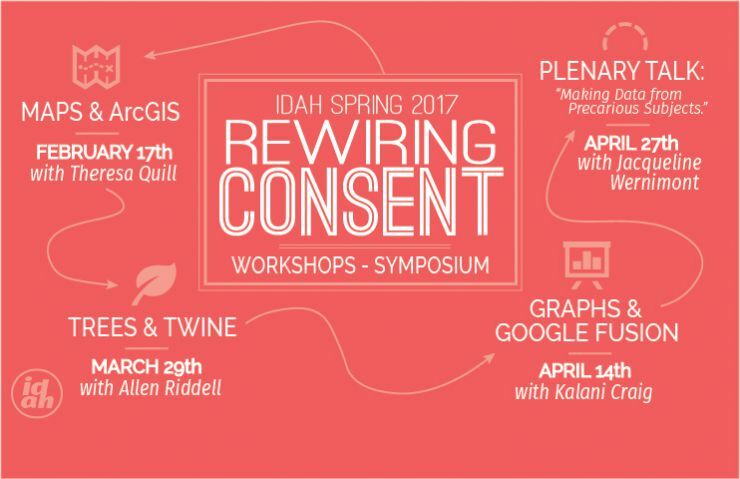 Because of the nature of the Rewiring Consent programming for IDAH's 2016-2017 speaker series, we will continue to update this page as necessary. How does the digital visualization of information persuade, enfranchise, mystify, or mislead its readers? How does it change the way we feel about facts and numbers? How does it shape our social view? How can it serve the aesthetic and critical missions of the Arts and Humanities? How can we use it to effect change? The current political administration has indicated its commitment to rolling back federally-mandated Equal Rights protections, including Title IX. Defenders of this anti-discriminatory legislation often point to Title IX data to argue the need for federal intervention. Yet recent stinging critiques of the digital humanities, such as “Neoliberal Tools (and Archives): A Political History of Digital Humanities” in this summer’s LARB, argue that digital practices conceal the personal, precarious, and unpredictable nature of lived experience. Taking our cue from IDAH and Patten Lecture events with recent Patten lecturer Franco Moretti, and in particular his 2007 work on Abstract Models for Literary History, we wish put to the test the assumption that human subjectivity makes poor data for GRAPHS, MAPS and (decision) TREES. In the process we hope to open up platforms for identifying and exploring new lines of inquiry in the arts and humanities. a concluding ‘outtakes’ conversation on classroom use (for faculty and graduate students) and critical/creative expression (for students and scholars). The workshops are intended for all members of the University community. IU faculty and students at all ranks are welcome to join any and all workshops. No prior experience using any of the applications is necessary. Beyond the workshops, IDAH will offer consulting hours to faculty and graduate students who want to develop pedagogical or research uses for the applications we demonstrate. We will also make available webographies or bibliographies to support further inquiry and critique. To encourage repeat participation, undergraduates who complete all three workshops will receive a book prize at the conclusion of the series. Students will also have the opportunity to exhibit their work during the Gallery Walk in April. Most victims of sexual assault do not file a report. In this workshop, we will reconfigure the flowchart of the filing process found in IU’s Title IX Report into a campus map in order to make this action more envisionable and therefore (possibly) more feasible. Along the way we will consider how to represent non-locational information in GIS and explore what maps tend to highlight or omit in the trajectories we wish to represent. Twine is the open-source interactive fiction platform that rose to national attention as the format of Depression Quest, the target of GamerGate. This workshop will ask participants to try out Twine’s decision tree structure in order to schematize the legal experience of launching a sexual assault case. Doing so will require us to take into account the degree to which the ‘player’ in such a scenario can control the game’s action or flow. We will conclude by discussing how the affordances of a choice-based story app can illuminate conditions in which agency and intention are restricted. The culminating conversation will happen in two parts in April. Graham Roberts (April TBA) is Senior Graphics Editor at the New York Times and leader of its immersive visual storytelling initiative. He is a five-time Emmy nominee, and his recent work includes a collaboration with NASA, titled Seeking Pluto's Frigid Heart (NYTVR Project). Jacqueline Wernimont (April 27) is a specialist in feminist digital media, histories of quantification, and technologies of commemoration. She is a collaborator on such multidisciplinary digital projects as the Eugenic Rubicon—a historical data and storytelling project that documents forced sterilizations in 1930s California; Vibrant Lives—an arts and performance-based collaboration which seeks to literally embody the data we use and shed; and Center for Solutions to Online Violence —an initiative that provides rapid response to the harassment of women and feminists of all genders. With responses from IU Faculty Justin Garcia (Gender Studies), Amy Gonzales (Media School), and Rebekah Sheldon (English). Reception to follow.